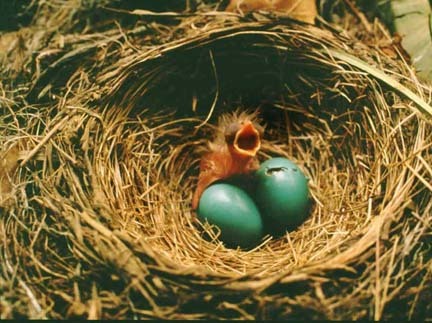 Today three robin hatchlings popped from their powder blue eggs. The wide-mouthed trio’s mother pivoted their nest on decorative beams just outside my wife’s home study door – a well-traveled doorway situated between the garden and the study and the kitchen. She built it in a day, the insides tight and smooth. Since then, she’s laid the eggs and often from afar watched the nest. Why this spot? I wondered. Today when I came home with our toddler daughter, I was foul. We had run out of milk, which, after a long day, made her wail much of the way home despite my random singing – “There once was a girl who cried all day long/Wah-wah-wah was her song.” – or reasoning with her that we’d run out of milk or sweet talking her or just trying to ignore her. Fifteen minutes later, I could hear nothing but grumbles within. “The robin babies hatched today, Papa!” my wife said as she took our own wide-mouth onto the porch. “Grumble,” I think my mouth said in reply. Somehow I couldn’t bring my mind to the moment. I just let it ride the residue of frustration from the previous fifteen minutes while I distracted my body with washing dishes. It would take another hour for me to wander outside the doorway, step up on a chair, and peer in at three hungry mouths, open and trusting. I think of that mother never wishing her nest could be in Paris or Rome or closer to the city or on the other side of the pond. Elsewhere is here. And even when my mind is elsewhere, I suppose it is here, too. Here is fine. Here, it turns out, may be the best place to be. Elsewhere is here. I like that, need to file that away. Today’s three highlights: having the time and space to really write for the first time in weeks; local, fresh, in-season peaches…. and a feeling of coming into my own lately. It’s not really confidence as much as it is a sense of belonging in various places in my life. -reveling in appreciation for my little beachside town of kailua as i commute on the bus to work in honolulu. seeing the morning light on the marsh, the mist rising off the pali and the amazing windward vista as i look up from my latest read. always worth a moment of wonder. -meeting an old friend (that i haven’t seen since in years she moved away) for lunch at the beautifully restored hawaii state art museum. -watching my sons interact and recalling just how badly the older one (now 20) wanted a brother (the other one is 13) when he was younger. they are such good friends.